A flotilla of ships carrying activists and aid for the blockaded Gaza Strip on Sunday finally steamed south from Cyprus, heading for a fleet of Israeli naval vessels determined to stop them. The ships, carrying more than 700 passengers, are on the last leg of a high-profile mission to deliver some 10,000 tonnes of building and other supplies to Gaza, which has been under a crippling Israeli blockade since 2007. Huwaida Arraf, chairman of the Free Gaza Movement, told AFP by phone from the boat Challenger 1 that the ships had started towards Gaza at around 3:00 pm (1200 GMT) on Sunday. "Israel is blocking an area about 20 nautical miles out from the Gaza coast and we expect to hit that area in the late morning or early afternoon" on Monday, she said. A Palestinian boy flashes the V-sign for victory as hundreds of Palestinians waited aboard fishing boats at the port of Gaza City to greet the so-called Freedom Flotilla. About six hour after their departure, three Israeli missile boats left their naval base in the northern coastal city of Haifa on a mission to intercept the flotilla, reporters on board one of the vessels said before being told to turn off their phones. In Gaza, anti-siege activists called on the international community to ensure the protection of the "Freedom Flotilla" which had been aiming to arrive on Saturday but was repeatedly delayed. "I am asking the international community to protect these boats from the Israeli threat," independent Palestinian MP Jamal al-Khudari told a news conference on a boat anchored outside the Gaza port. "If Israel blocks them, they have a strategy for getting here," said Khudari, who heads the Gaza-based Committee to Lift the Siege. He did not elaborate. 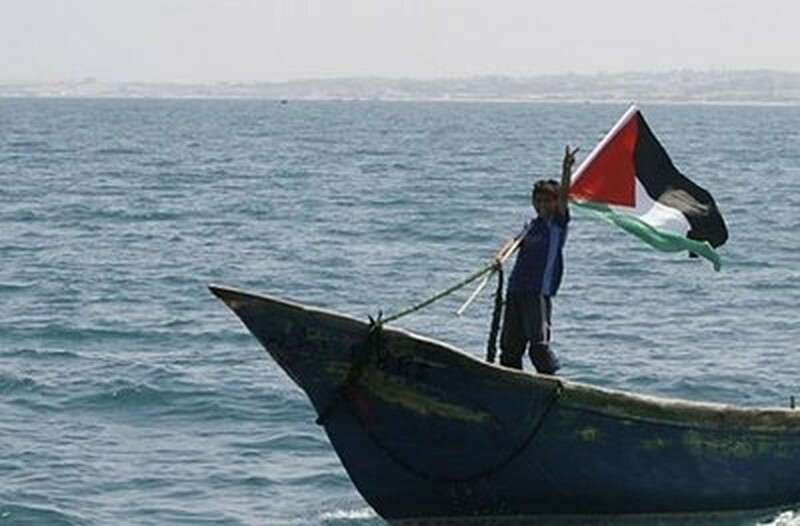 With the flotilla expected to approach at some stage over the next 24 hours, Gaza fishermen took to the sea flying Palestinian flags as well as those of Greece, Ireland, Sweden and Turkey -- all of which sent boats. Demonstrators also released scores of balloons with pictures tied to them of children killed during Israel's massive 22-day offensive against Gaza that ended in January 2009. Israel has slammed as "illegal" the convoy's attempt to break the Gaza blockade and its navy is ready to intercept the ships, tow them to the Ashdod port and detain the pro-Palestinian activists. Several Israeli warships could be seen off the Gaza coast, an AFP photographer said. Khudari said the convoy, which is carrying hundreds of civilians and a handful of European MPs, would stop outside Gaza territorial waters before attempting to make landfall. It will travel "in two stages," he said: "First they will stop in international waters at 30 nautical miles (from Gaza), and tomorrow (Monday) they will reach the shore." Audrey Bomse, legal adviser to the Free Gaza Movement, said the flotilla was likely to avoid a confrontation with the Israeli army during hours of darkness. She also said the activists were considering sending "a second wave" of boats later this week. Israel has called the convoy a media stunt, insisting there is no humanitarian crisis in Gaza despite reports to the contrary from aid agencies and offering to deliver the supplies through its own land crossings. "This is a provocation intended to delegitimise Israel," Deputy Foreign Minister Danny Ayalon said on Saturday. "If the flotilla had a genuine humanitarian goal, then its organisers should have transferred something for the abducted soldier Gilad Shalit as well," he said of the Israeli snatched by militants in 2006 and held by the Hamas Islamist movement which runs the enclave. The activists responded on their website that they had offered to take in a letter for Shalit from his family but received no response from their lawyer. Hamas's refusal to release Shalit is cited by Israel as one of the main reasons for imposing the economic blockade on Gaza in the wake of the group's violent takeover of the territory. The confrontation with the flotilla could cost Israel tens of millions of dollars as it detains the activists, pays for docking the ships and transports the aid to Gaza, the online business magazine Globes reported. It said the detention facility alone had cost three million shekels (780,000 dollars, 640,000 euros) and the costs of holding the activists would mount if they refuse to accept Israel's offer to buy them tickets home. Pro-Palestinian activists have landed in Gaza five times, with another three unsuccessful attempts since their first such voyage in August 2008. The latest is their biggest operation.